This striking 3D stadium art recreates some of the country’s most celebrated stadiums and their home state. 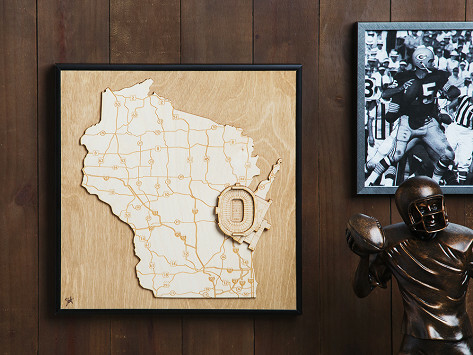 The map is made by layering laser-etched Baltic birch wood pieces to create a bird's-eye view of the stadium and its surroundings, like rivers and highways. A black metal frame finishes off each eye-catching piece. Dimensions: 12" x 18" x 1"
I purchased the Stadium Map Art for Auburn for my hubby for Father’s Day. He loved it ! It is hanging just above the Art Map our family gave us of Lake Lanier where we live. Please let me know when I can get an Auburn city map with the stadium in it. I see that you have one for Tuscaloosa! We Auburn fans want one of Auburn! I’ll order one right away !